Edison had brought sound recording into the world. It was, it seemed, a marvel: to be able to record and replay that recording on a phonograph was indeed groundbreaking technology at the time. However, the crackle, hiss and distortion that accompanied the sound that the steel needles of the day produced marred the beauty of the music and the human voice. 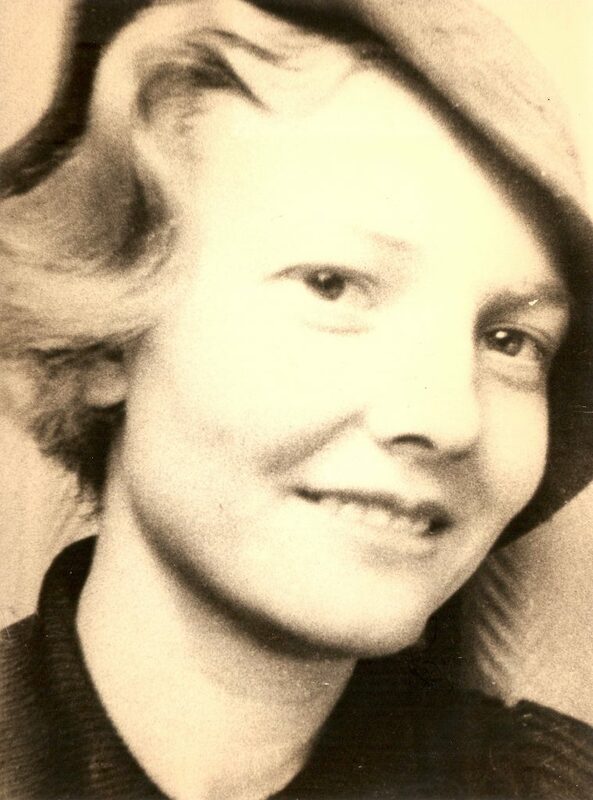 Marie Killick, as a young woman, wanted to put her knowledge of sound recording in the early 1940s to the task of finding an answer to the problem, she came up with a solution. Patent 603606 was a novel and an inventive step. She designed a stylus with a truncated tip; a sapphire or diamond jewel, cut to a flat at the tip and engineered to dimensions that would only allow the stylus to ride on the sides of the walls was the answer. Because of the jewel tip, it could be used for hundreds of playings of a record. It outshone the steel needles that caused excessive wear and distortion in just one playing of a record, as the needles rode on the bottom of the record groove and acted like a chisel destroying the sound recording. The patent specifications below give a detailed account of her invention, which she manufactured and sold under the name of Sapphox. When her case for infringement came before the courts in 1957, Pye themselves parroted the views of the patent agent, claiming the stylus was only a matter of design and not a valid Patent and that her claims in her specifications for the Patent were too broad. The Judge of course took and different view and she won her case and when they appealed to the Appeal Court, they lost that too. During the 1940s applications went forward in France, Italy, Belguim and Switzerland. In June 1948 the British and Belgian Patents were granted. In August 1948 the Italian Patent was granted. In September the Swiss patent still needed some clarification but was later granted. Other world patents applications were in progress including in America, Australia, Canada, Holland and South Africa. Realising the value of Sappox, Marie was set on protecting her invention around the world. Once, however, Pye Ltd started to infringe her patent, her own markets were effected – her distributors told her there was something similar on the market and her orders, which until that time had been growing, started to dry up. To test the market, in 1950 Marie decided to put the British Patent up for sale. 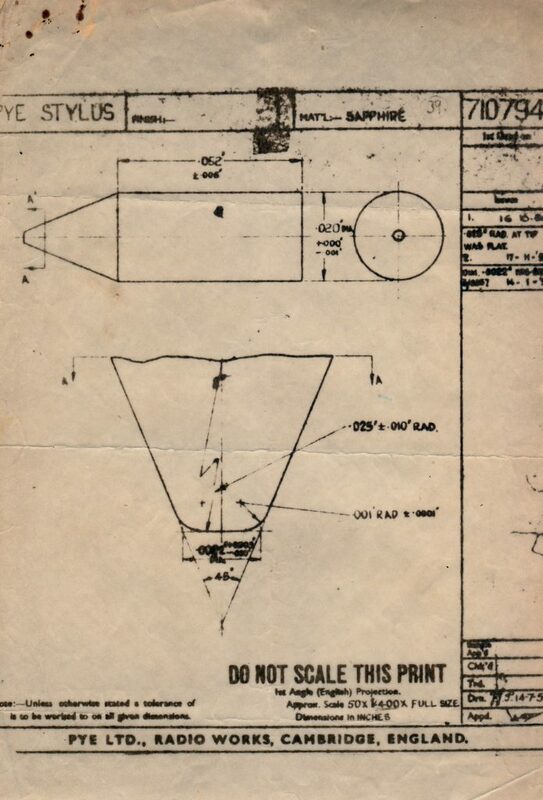 E.M.I stated to her at a meeting, that in October 1949 her patent had been allowed to lapse. 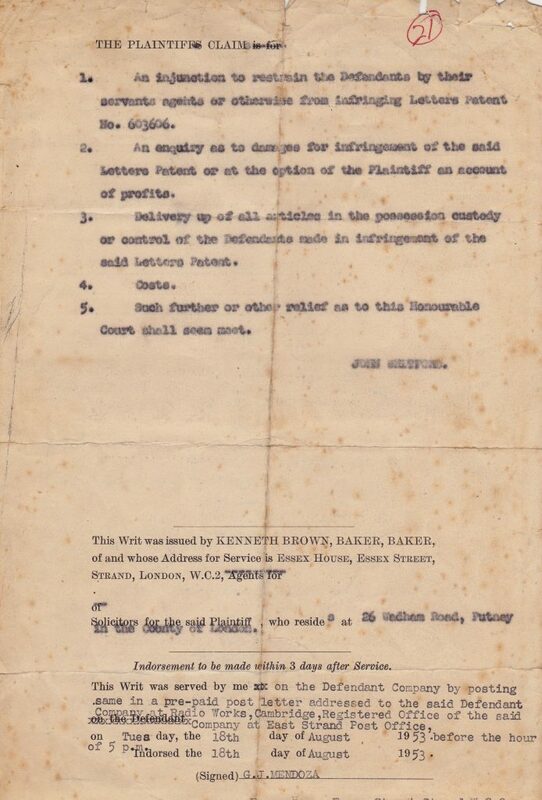 Unbeknown to Marie, Gill Jennings & Every, her patent agent allowed her applications for the above patents to lapse, they claimed for lack of instructions as to whether to pay the fees! This was hotly disputed by her and she applied to have the British Patent restored, intending to do the same with the other patents and patent applications once the British Patent had been restored. Lack of funds due to Pye Ltd’s infringement, which caused the collapse of her own business prevented her from this course. During the period the patent had lapsed, Pye and others were free to manufacture her invention – which they did for nearly two years. Profiting from her stylus as the music industry expanded, and the market for sound recording with it. 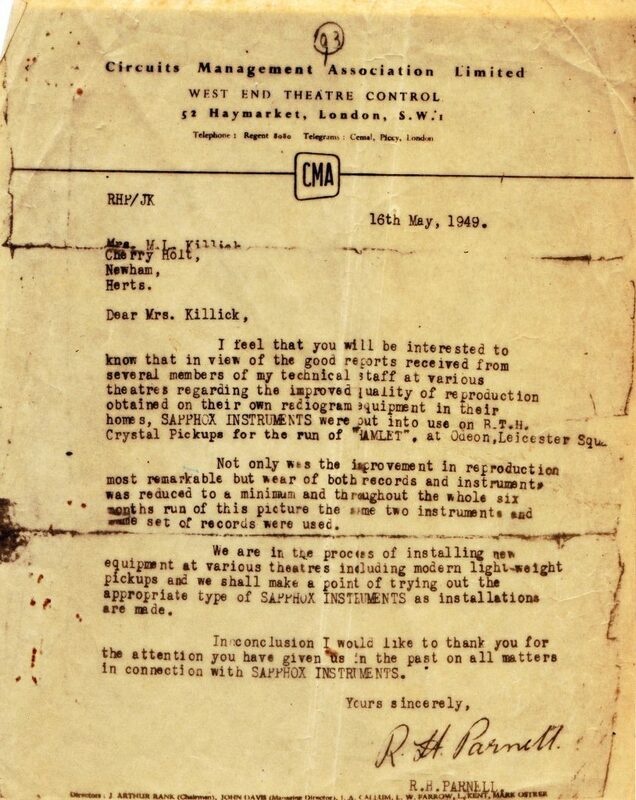 As already stated, it had only been after she put her British Patent up for sale in 1950 and she told by one of the combines that her patent had lapsed that she became aware of the situation. This accounted for the market being flooded by others. She immediately put in an application for the restoration on her Patent. After a long delay, the Patent was restored. 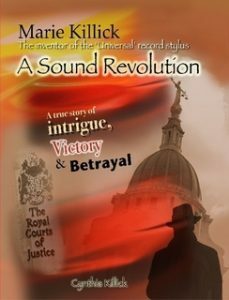 The cause of the long delay is described in the book ‘A Sound Revolution’ involving a nun of the Sisters of Mercy, who personally visited the Controller General in the Patent Office to make him aware of the suffering that the delay in restoring the Patent was having on Marie and her family! Pye had in fact opposed the reinstatement of the British Patent. Their opposition speaks for itself, if the patent, as they claimed had no value and was merely a matter of design, then what was their interest in opposing its reinstatement? Their opposition came to no avail when the British Patent was restored by the Controller General of the Patent Office. 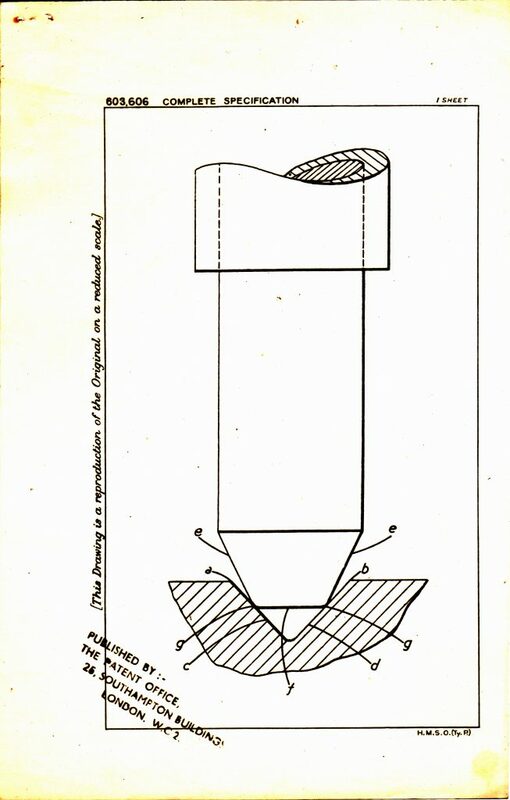 Pye Ltd continued to manufacture a copy of her stylus and in 1953 Pye were issued with a writ for infringement of her patent. 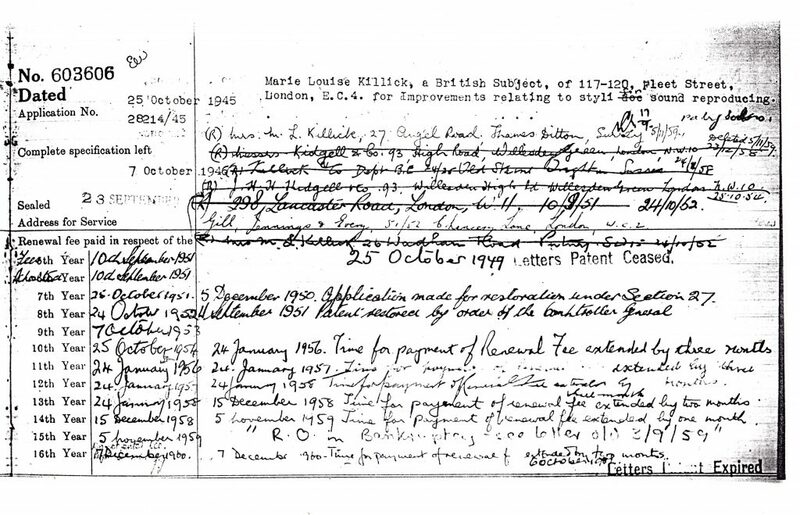 From the restoration of the British Patent in 1951 the payment of fees was overseen by Marie in person; often having to ask for an extension of time, due to her lack of funds, which was readily granted. Sadly, due to Pye Ltd’s infringement, Marie was never in funds to pursue the restoration of her World Patents or the application for other patents where they had been pending. This would form one of her claims to damages awarded against Pye by the High Court and Court of Appeal. Record issued from the Patent Office of payment of fees and the date the patent lapsed and was then restored. Automatic machine designed to manufacture many thousands a week. Marie also invented an automatic machine capable of making 10,000 styli per week. She applied for a patent, application No. 30004. These machines were intended to produce many thousand styli a week to keep up with the growing demand. In 1946 Decca offered Marie £750,000 for her British Patent Rights. They stated to her that it had passed all known tests and it was the best thing on the market. Marie refused their offer, preferring to hold control her invention and expand her markets worldwide as her Patent applications were granted. Just one contract alone with wholesaler Shannon & Bishop in 1947 agreed to take delivery of 1,000, quickly rising, to 2,000 per week at 5/6p each, minimum of 104,000 per annum = £57,286 gross per annum. Profit £18,000. Whilst Marie was in Switzerland an agent from Decca, Mr Gormere wanted her to fly to Belgium to negotiate a contract with Decca to fit her styli in all their radiograms. The letter below shows the impact the Sapphox was then having on the market. 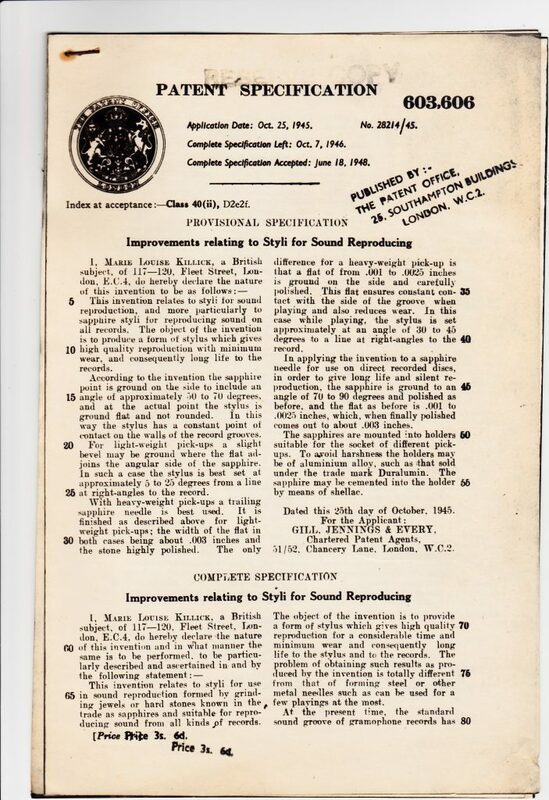 Not only was the improvement in reproduction most remarkable but wear of both records and instruments was reduced to a minimum and throughout the whole six months run of this picture and the same two instruments and set of records were used. we are in the process of installing new equipment at various theatres including modern light-weight pickups and we shall make a point of trying out the appropriate type of SAPPHOX INSTRUMENTS as installations are made. In conclusion, I would like to thank you for the attention you have given us in the past on all matters in connection with SAPPHOX INSTRUMENTS. Marie’s invention was having a profound effect on the musical world. As already stated, she had applied for patents covering her invention around the world. Many were granted, and others were pending when Pye Radio and others decided to get in on her expanding business. Pye’s infringement had the effect of flooding the market with their counterfeit styli. Shannon & Bishops complained that there was something similar on the market and broke their contract with Marie by refusing to take any more of her styli because she could no longer provide them with a monopoly in their area. This was repeated with other contracts and Marie was squeezed out of her rightful markets. Her only option was to gather evidence of Pye’s infringement and pursue them through the courts. A long and hard battle awaited her. What was the music industry to do? Her invention put the musical companies at a disadvantage – all they could offer the music lovers at the time were the steel or thorn needs with the sharp tip, which did so much damage to the record. Pye Ltd continued to pirate her idea that infringed her patent. She was only a small company and they were a multimillion affair. They called their copy of her invention the ‘Universal’ stylus and as the book ‘A Revolution in Sound’ tells, they quickly reduced what had been her growing markets to fail, forcing her out of business as her monopoly was breached. In effect, Pye Ltd flooded the market with their infringement and so she was no longer able to offer Shannon and Bishops and other wholesalers an exclusive marketing contract. When this came to light, Marie decided to fight for her rights in the Law Courts and her solicitors proceeded to have a Writ issued on 4th August 1953 on Pye Ltd for infringement of her Patent 603606. Four years later on December 21st 1957, Pye were found guilty of infringement in the Chancery Division of the Royal Courts of Justice, London. They appealed to the Appeal Court but on 22nd July 1958 the Appeal Court upheld the judgement of the Lower Court. Pye Radio Ltd now had to face the prospect of paying out enormous damages for their infringement. 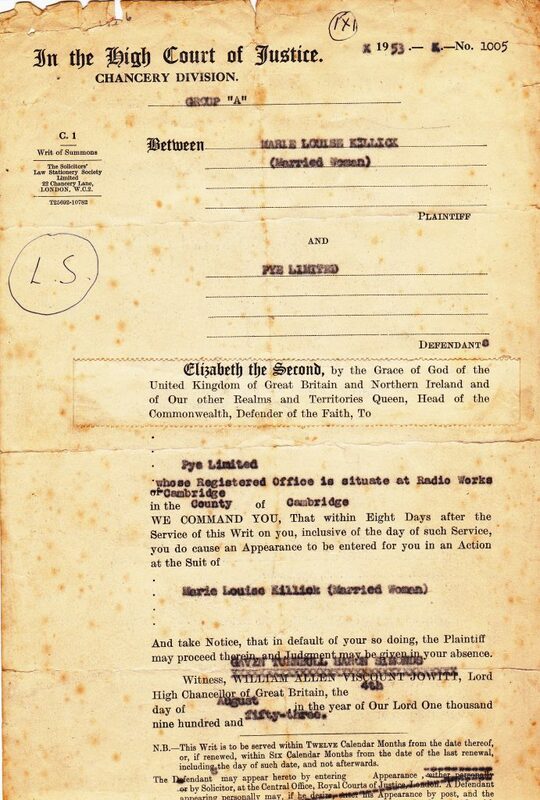 The courts had awarded Marie Killick an inquiry into full heads of damages; which would include the loss of her business, her world patents, and those patents applications pending, her home, her children’s education, all would now be brought by her before the court in settlement of her damage claim. When the writ had been issued Pye had taken out an insurance debenture with the Prudential Insurance Company for the sum of £2.5 million to cover their retailers in the event that Marie would sue the retailers for selling Pye’s infringing styli. 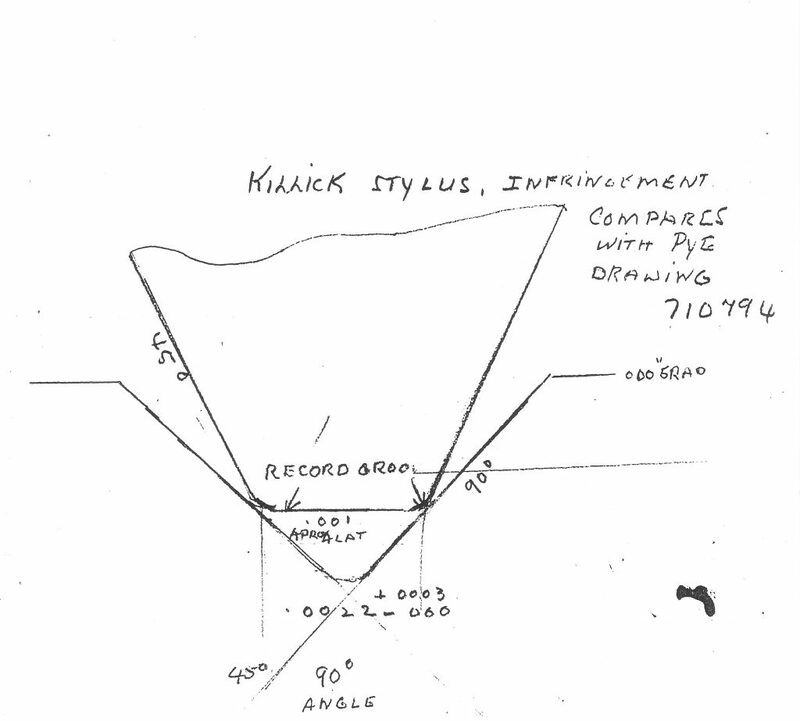 Drawing of Marie Killick’s stylus submitted as evidence. On Tuesday 22nd July 1958, the Evening Standard newspaper reported that Pye’s and other musical combines meet after Appeal Court uphold the judgement in Marie Killick’s favour in the Royal Courts of Justice. “A fraction of sapphire on the end of a needle was worrying Britain’s gramophone and sound producing industry today. About half the 78 million records sold last year must be played by a sapphire or diamond tipped needle. The other half playing for only a short time, use steel or fibre needles. Diamonds cost pounds where sapphires cost shillings, so diamond tips are put out for the masses. 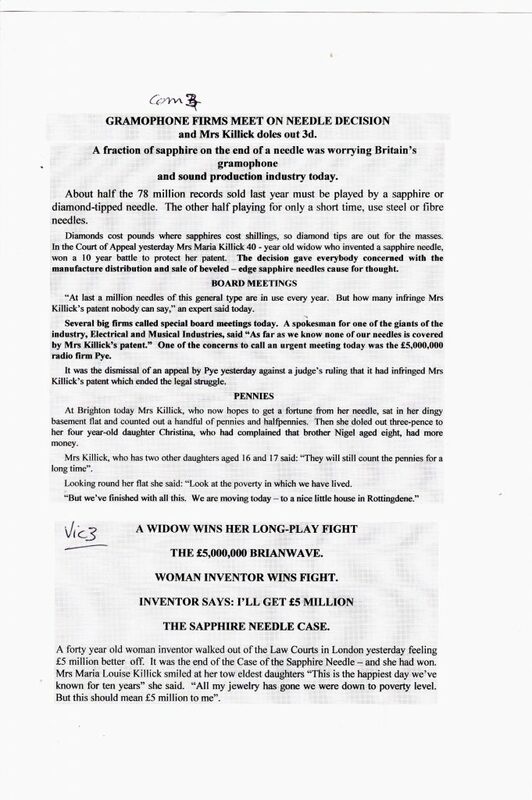 In the Court of Appeal yesterday Mrs Maria Killick 40 year old widow who invented a stylus sapphire needle, won a 10 year battle to protect her patent. At least million needles of this general type are in use every year. But how many infringe Mrs Killick’s patent nobody can say,” an expert said today. Several big firms called a special board meeting today. A spokesman for one of the giants of the industry, Electrical and musical industries, said: “As far as we know none of our needles is covered by Mrs Killick’s patent.” One of the concerns to call an urgent meeting today was the £5,000,000 radio firm Pye. The industry was really worried by the judgements against Pye Ltd. If she received the damages due to her against Pye, they knew that their instruments would also be investigated and if found to infringe her patent then they too would be sued. Marie’s infringement case against Pye Radio Ltd made legal history and is still cited in Law Schools to this day. 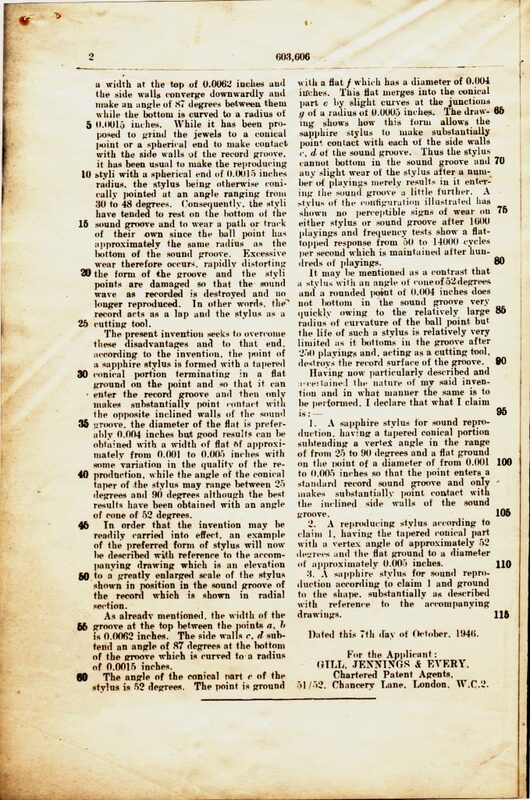 Had she received the damages due her, she was going to restart manufacture of her invention; request an extension of her patent for the period she had been unable to manufacture, due to Pye’s infringement. Marie had every intention of taking other musical combines to court for their infringement of her patent. They were worried and had every right to be!